Creekstone Prime Briskets, salt & pepper; smoked over maple & oak for 14 hours. Sold by the 1/4 pound. Always made in house with healthy, happy pigs and simple fresh ingredients. Variations include, Mexican Chorizo, Andouille, Bratwurst, Sweet Italian, Winter Garlic, Cotecchino and Kielbasa. Sliced brisket on toasted brioche with crunchy caraway slaw. Braised chicken with shallots, jalapeño, vinegar, and baked beans served on toasted ciabatta with pickles and white onions. classic Tuscan roast pork with salsa verde and crispy skin served on toasted ciabatta. Roasted sweet potatoes with garlic, rosemary & dark chili powder served on toasted ciabatta with crunchy caraway slaw. Pineapple brown sugar and chili glazed ham served on toasted focaccia with red wine vinegar onions, kosher pickles and unmelted cheddar. A-OK Berkshire Barbeque is located in North Adams, MA in the old Sprague Electric guardhouse. Conceived in 2017, this Meat Market and BBQ spot sits on the campus of the Massachusetts Museum of Contemporary Art. 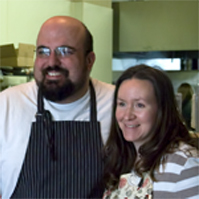 Founded by Aaron & Alexandra Oster and Orion Howard with the specific goal of putting better food on the tables of those within our community, we provide a simple, straightforward menu, great service and a fun atmosphere. 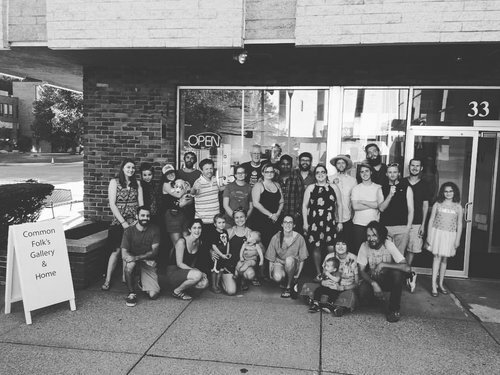 Open at noon Friday through Monday, A-OK sells it fresh everyday until it’s gone. Give us a call or come on down and place your orders! Our little Guardhouse here, shown as part of the first mill on this site, the Arnold Print Works. We’re still here! Please feel free to contact us for directions, testimonials of your undying affection or just to share your experience with us. Making our little dream come true is a community effort and we want to share the love with those that have been incredible with their support of us. Local Beer thoughtfully brewed and expertly poured. A new motel changing the dynamic of the interactions between guest and nature. 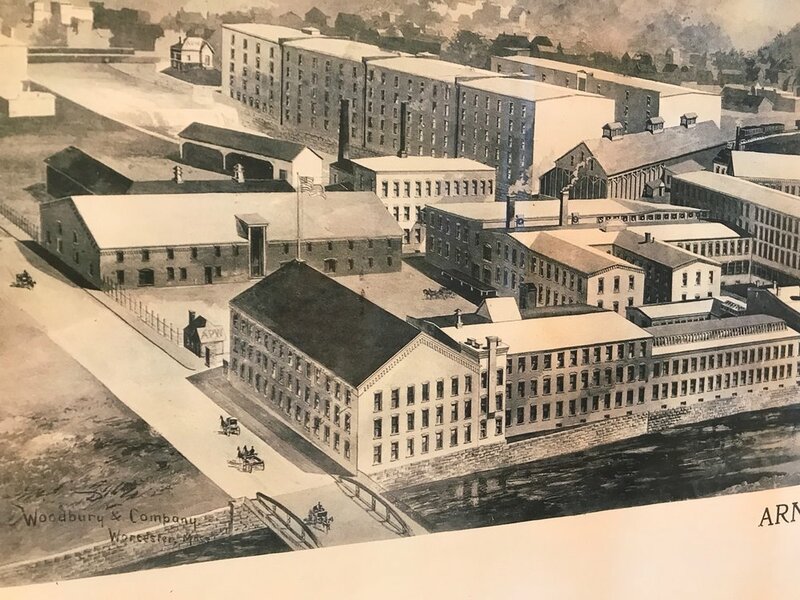 Perfectly located to enjoy and explore North Adams situated along river street beside MASS MoCA. Opening a small business in a rural community means that we are lucky enough to be surrounded by some talented and very hard working farmers and producers. Here they are. Kim sitting with his happy piggies. East Mt Farm, owned and operated by Kim Wells, has been selling a variety of meats to local families by the side or whole since 1984. 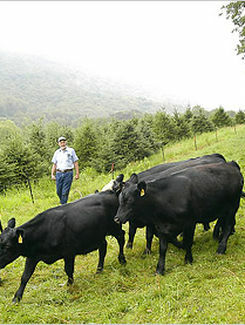 They raise pastured beef, pork and chickens. Beef cattle are rotated daily, usually in the afternoon, onto fresh pasture providing them with high energy grass. To finish we supplement pasture grass and hay with a limited quantity of grain. 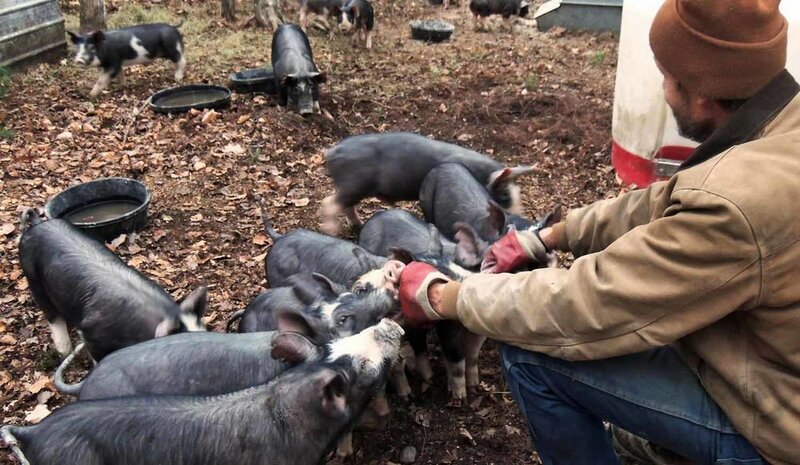 The pigs are raised in the woods surrounding the pastures on a diet of locally produced grain and whatever their incredible snouts discover while rooting through the forest floor. Don and his Wife and Partner Andrea Cascun. Cascun Farm is located in the rural farming community of Greene in upstate New York. have the privilege of owning 125 acres of rolling pasture, it is indeed picturesque. Cascun Farm is a family run business where we strive to produce only the highest quality products to feed our family and yours. We raise and process chicken, ducks, geese, turkey and rabbits right here on our farm with no use of antibiotics or growth hormones. For many local communities this may be the only way to preserve the rural landscape, enhance economic development, and enable current and future generations to stay on the farm, caring for their land and livestock. Our foods are purchased directly from small-to-medium sized family-run farms throughout the Northeast. We pay a premium for all beef, lamb, veal, pork, fruits, vegetables, and dairy products from our farm partners. Our commitment is to provide these locally-raised products in a manner that compliments their menu or retail store applications. Home to a growing herd of alpacas raised for their beautiful yarns and ultrawarm, ultrasoft garments. The farm also produces maple syrup from their new state-of-the-art sugar house. Horse drawn hay and sleigh rides, farm store and more. They have been admitted to Century Farms by the Massachusetts Department of Agricultural Resources. This is an acknowledgment of century-old (or more) family farms. 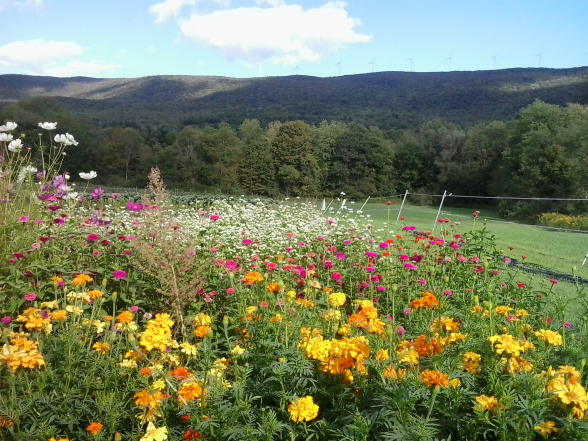 grows fresh, flavorful produce in a beautiful setting along the North Branch of the Hoosic River in Clarksburg, Massachusetts. The farm uses sustainable, environmentally-sound methods to create a healthy and diverse farm eco-system while offering a community-centered vision for developing the local food system. Our fresh, farm produce is available through CSA farm shares, at local farmers markets, to individuals, and for special events. We are hyper-local that is, our produce typically travels less than a few miles from the farm. No GMOS, chemical fertilizers, or pesticides, are used at Many Forks Farm. Blue Barn took on the enormous task of designing, creating and re-inventing the wood-fired cabinet smoker. Their entire ethos of building is based around the effectiveness of the equipment to function. Being that these two pieces of equipment are the cornerstone of our bbq business, we’re lucky and honored to be featuring their smokers in our smoke house. Jason and his team were also responsible for our windows, our awning and new bench and seating area to arrive in 2019. Want to share the love with someone you care about? Our gift cards are a great way to give the gift of barbeque all year round.